I had my first proper halva experience at The Halva Kingdom in the Machane Yehuda Shuk in Jerusalem. I’d never really liked halva before that–the one or two times I’d tasted it, it always had a weird, crumbly texture and slightly bitter aftertaste. But in the shuk, surrounded by dozens of varieties of blocks of halva, I couldn’t resist trying the sample offered to me by the charming vendor. You guys, it was so, so good! I was pleasantly shocked at how much I liked it. It had this unbelievably creamy, melt-in-your-mouth consistency and a satisfying richness. I bought two varieties–pistachio and coffee–to take home, and couldn’t resist nibbling on the candy the whole tram ride back. Since then, I’m a total halva convert. I just love its unique texture–it’s dense, creamy and fluffy all at once, and its distinct sesame flavor. I also adore tahini and have been using it in myriads of ways: mixed with honey and swirled with Greek yogurt, in an ice cream that tastes like the frozen version of halva, even spread on toast with melted dark chocolate. I decided it was high time to turn my favorite flavor trio into a baked good and came up with these buns. 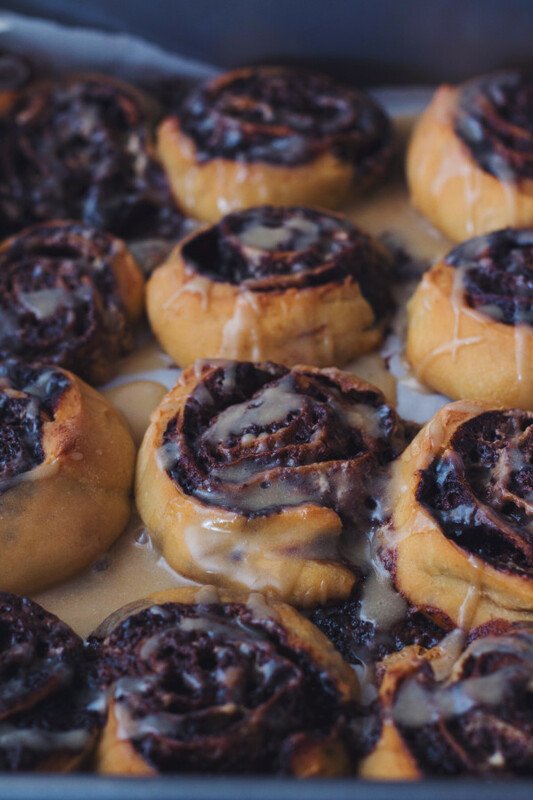 Here, a cinnamon-spiced dough is topped by a butter, chocolate and cocoa filling, which is then swirled together with a sweetened tahini paste. The whole thing is topped with crumbles of halva and sliced into big, thick rounds which bake up soft and fluffy. These buns have a lot going on, but it just works. Even non-halva lovers will get in on the action, finding the combination of sesame and chocolate deliciously alluring. But then again, who can resist the siren call of a bun? Yell “I got buns, hun!” and you’ll have everyone lined up, ready to taste these for themselves. Make the dough. First, melt the butter in a saucepan, add the milk and heat until warmed through. In a small bowl, combine the yeast with a couple of Tbsp of the warm milk mixture and 1 tablespoon of the sugar. Let sit until foamy, 5-10 minutes. As the dough rises, make the chocolate filling: in a saucepan over low to medium heat, melt the butter and chocolate together until smooth. Stir in the powdered sugar, cocoa and salt. The mixture will form a spreadable paste- set it aside until needed. Next, make the tahini filling. Combine the tahini, sugar, salt and cinnamon and stir well until thoroughly combined. Set the filling and the halva pieces aside until needed. Once the dough has risen, divide it in half. On a lightly floured surface, roll out one half of the dough to a rectangle roughly 10×17 inches, with the long edge facing you. Spread half of the chocolate filling over half of the dough, making sure to spread it all of the way to the edges. Top with half of the tahini mixture, and using a toothpick (or your fingers) swirl the chocolate and tahini together. Sprinkle 1/4 cup of the halva pieces evenly over the chocolate and tahini covered dough. Now, roll up the dough. Roll it up the short way- perpendicular to you. Slice into 12 buns. 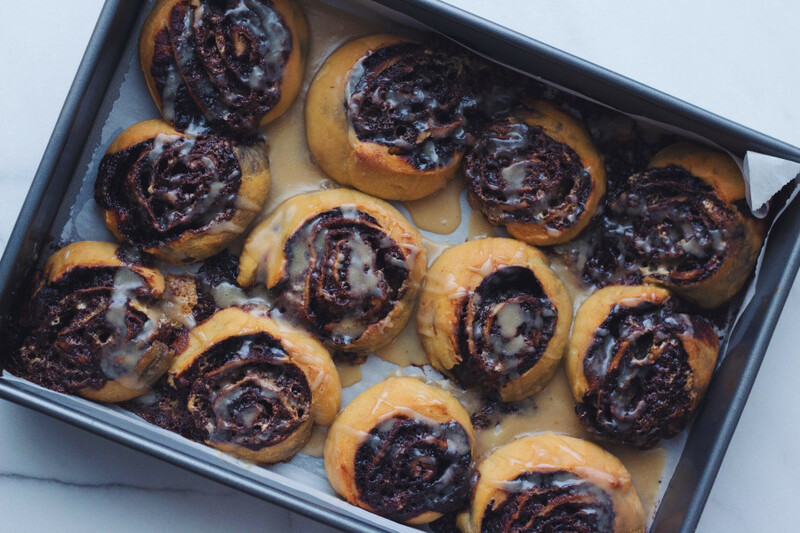 Transfer the buns to a baking paper lined 9×13 pan. 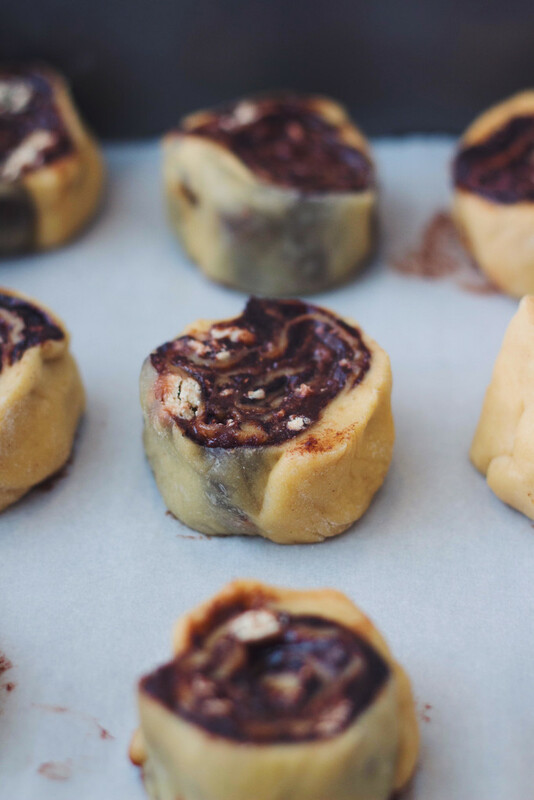 Repeat the above process with the second piece of dough and the remaining chocolate paste, tahini filling and halva pieces. Transfer the buns to another lined 9×13 pan. Cover the buns with a clean kitchen towel and let them rise for 30-40 minutes, or until big and puffy. Preheat your oven to 350ºF.